We regret to announce that our iPhone / iPod touch applications will be stopped distributing as of 28 February, 2019. For customers who have already downloaded or purchased the apps, you can continue to use them, however, they are no longer supported to the latest devices and OS. Please note that after the distribution ends, you will no longer be able to download the apps again from the App Store. We apologize for any inconvenience caused and deeply appreciate your understanding. Measure sound anytime, anywhere! The ultimate version for iPhone/iPod touch. ASA series measurement and analyzing techniques have been condensed and incorporated into this tool. 1/1, 1/3 and 1/6 octave bands are selectable. In audio analysis, a resolution of 1/3 octave is the norm but this application enables you to perform more detailed analysis. By playing the pink noise on your CD player, you can easily measure the actual frequency responses on the actual site. Equalizers can be easily tuned by pink noise measurements. The tool assists you in determining the setup position of car audio and adjusts your surround system. Allows you to see the differences in channels. Useful for comparative observation. 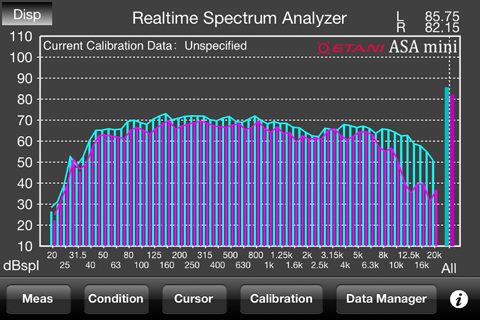 Enables you to automatically adjust the microphone characteristics based on your calibration data. 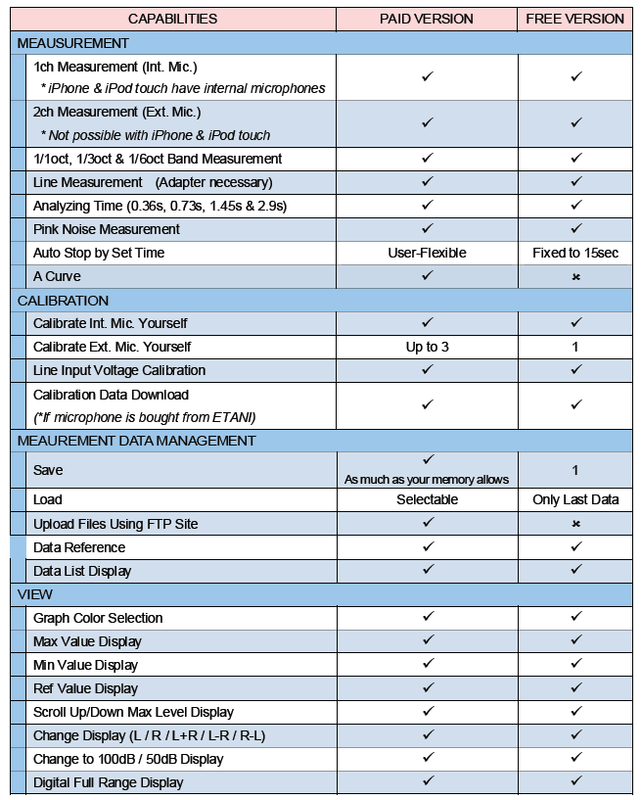 The microphone with calibration data is an option. If you have a reliable data, you could create a calibration data file yourself. ■ The differences between the paid version and the free version are illustrated below. In the paid version, you can save data and use an A-curve filter.